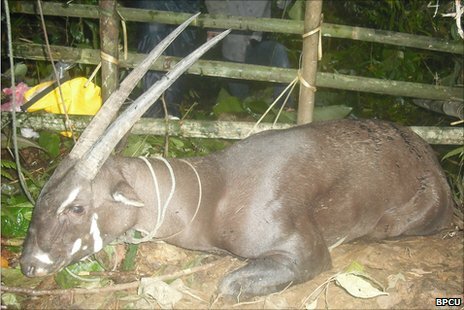 A rare mammal that is two horned with antelope like appearance has been caught in South Asia. It has been nicknamed Unicorn, although it is two horned. The creature that is called Saola is very rare. It is reported that only a few dozens of them has been left in the world. The creature was first discovered in 1992 in south Asia and the biologist was shocked to find the creature stating, this is the first time they have seen such an animal. Since then, the biologist were searching for this animal and so far remained unsuccessful. The only way they could know about the animal was through local villagers and photos taken by automatic cameras. The Saola found is believed to inhabit the Annamite Mountains of Laos and Vietnam, where the villagers found it. But before the wildlife team reach the spot, the animal was dead. The disappointed officials, have requested the villagers not to capture any Saola if they come across any such animal in future. “This incident highlights the importance of Laos to global wildlife conservation. Saola and several other rare endemic species are found almost nowhere else in the world,” said Latsamay Sylavong, the national representative for the IUCN Lao programme. India Blackout: Half of India Plunges in Darkness! !